Filters twice, like no other. The P7 is the king of all French presses, and the culmination of our efforts to design and engineer the ultimate way to make coffee and tea. Under the hood you’ll find ESPRO’s patented double micro-filter, for the cleanest cup you can get. The two patent-pending filters are 9-12 times finer than a common French Press. They get beneath the grinds and filter twice, leaving all of the flavor and none of the grit. Two vacuum insulated stainless walls keep your coffee hot, and the outside wall cool. Brew now, and serve later! And with no glass to break, it might be the last press you buy. 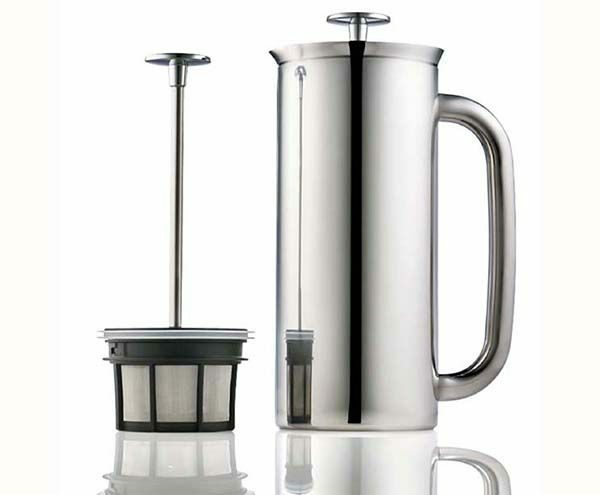 Espro, from Vancouver, British Columbia, has completely designed the French Press. They stand by their products with a lifetime guarantee. Every element in their products is carefully considered. Stainless steel is used because it imparts no flavor and doesn’t oxidize or degrade over time. Food-grade paper filters are the thinnest possible biodegradable material, so environmental impacts are minimized. Insulation is ultra-light, and never deteriorates. BPA-, BBP-, and phthalate-free plastic meet the highest possible standard for food-grade plastic in the industry. They neither hold nor impart flavor, and pose no risk of leaching into food over time.